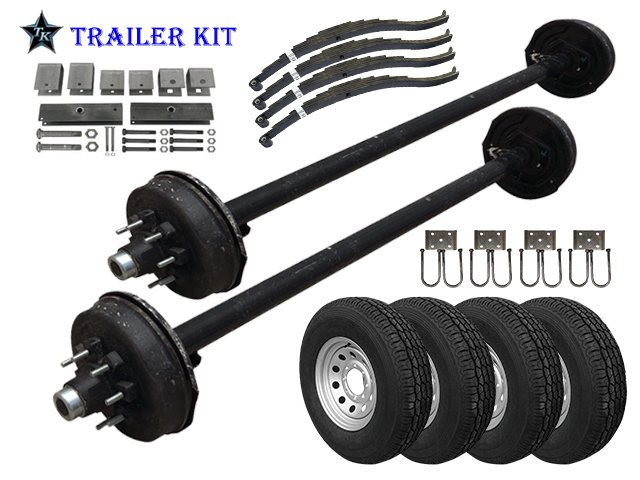 Instead of making you search for separate parts and pieces for your trailer, the team at The Trailer Parts Outlet did the hard work for you and bundled everything together into these TK Trailer Kits. You can find the perfect bundle and get fast shipping on every order. Instead of hunting for individual parts, you can purchase your kit and get to work on building your trailer. 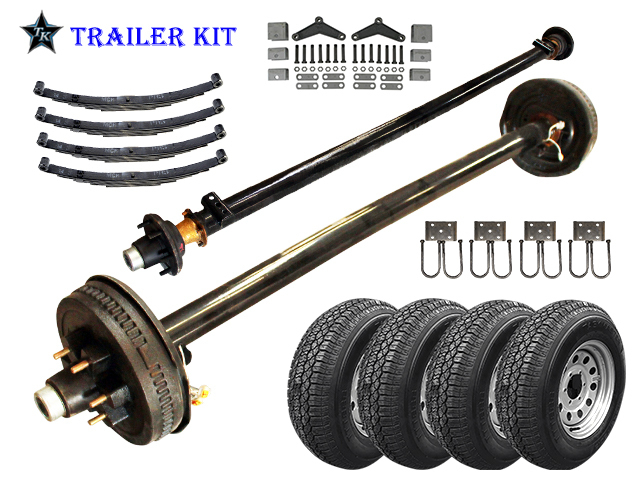 Each kit comes with the axles, suspension, tire and wheel assembly, and everything else you need. If you have questions about a kit, then please don’t hesitate to contact us right away. At The Trailer Parts Outlet, we pride ourselves on providing the very best products at outstanding prices. We want our customers to be able to find the premium options for their new equipment, and one of the easiest and most convenient ways to do that is with a trailer kit. Instead of trying to piece together everything from multiple sources, you can find easy-to-assemble kits that make putting your trailer together a cinch. We’ve created a variety of options to choose from, and if you have any questions, we’re always here to help! The first step to building your new trailer is to decide what type of trailer you need. Are you looking to build a car hauler so that you can transport your vintage automobile to shows around the country? Do you need a utility trailer that can hold equipment and materials so that you can transport everything to a job site? Whatever the case may be, knowing exactly what you need will make it easier when it comes time to choose your trailer kit. Another thing to keep in mind is the amount of weight that your trailer will be carrying. We carry both light-duty and heavy-duty kit options, so if you’re using your trailer for lawn and landscaping work, you may need a lighter option to carry small mowers, leaf blowers, and any yard and lawn debris. If you’re going to be hauling heavy items such as steel I-beams or construction machinery, it will probably be best to choose a heavy-duty option. If you’re not sure which axle capacity you need, our team can help you choose the appropriate options. 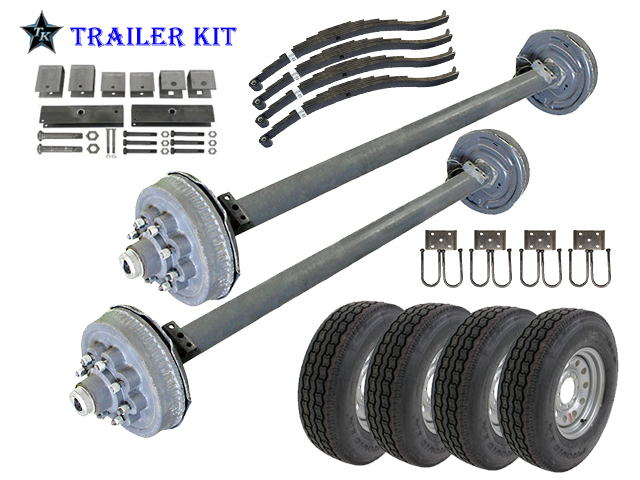 If you’re looking for the right trailer kit, then look through our catalog today. We have an outstanding assortment to choose from, and you can find a trailer for virtually any industry and any application. 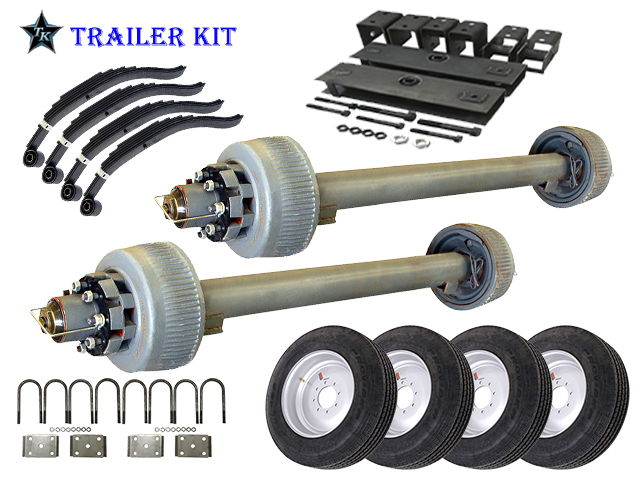 Each kit comes with everything you need to assemble your new trailer, and before you know it, you’ll have the trailer on the road behind your truck. When sourcing trailer parts, you may go to a local dealer who usually has everything you need. You can often find couplers, axles, and tires, but what happens when they don’t have the wheels you need or the right fender for your new trailer? At The Trailer Parts Outlet, we’ve collected all the parts you need in one place, and put them together to create trailer kits that are quick and easy to assemble, so that you can get your equipment on the road in no time. If you’ve built a trailer in the past from the parts you had lying around, you may have gotten to an integral part of the process, only to find that you didn’t have the right nut, bolt, or plate. You can always make do with a makeshift part, but what happens when it compromises the integrity or safety of your trailer? The last thing you want is to have a washer come loose or a U-bolt come off while you’re pulling the trailer down the highway. 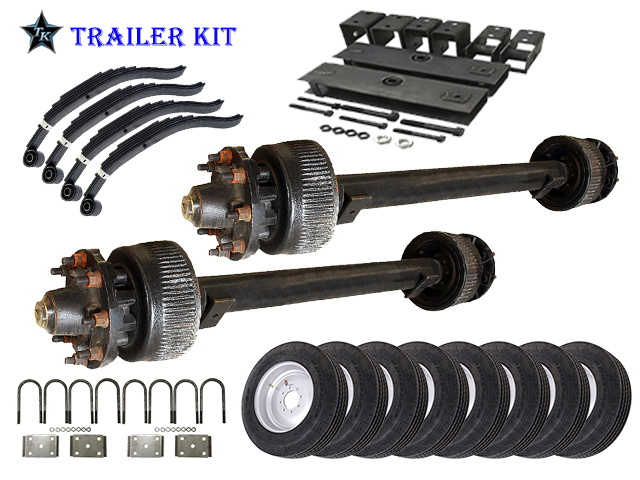 Our kits take the stress out of trailer assembly, since all the parts you need are in one place. 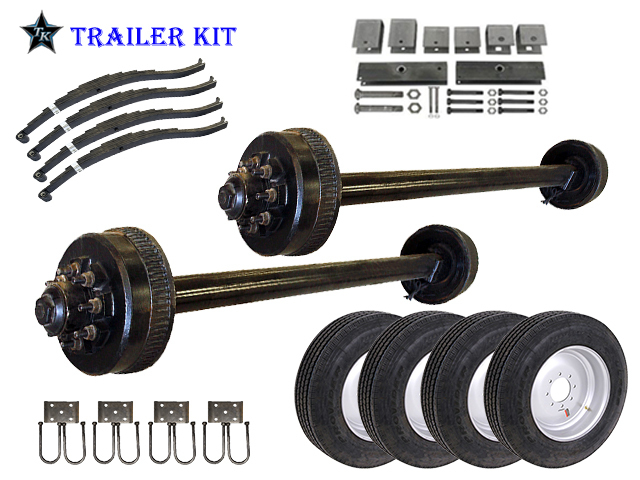 Every kit comes with the axles, hanger kits, springs, tire and wheel assemblies (TWAs), and everything else you need to make the perfect trailer. All of the parts have been sorted and marked, and you can build from the ground up, adding components in the proper order. If you’re assembling a trailer for the first time, there’s no need to worry, as we will include easy-to-follow instructions with your kit. Oftentimes, when you build a trailer out of random or makeshift parts, you may not end up with exactly what you had in mind. The trailer may be roadworthy and it may serve the purpose you need, but it’s still not what you wanted when you started. 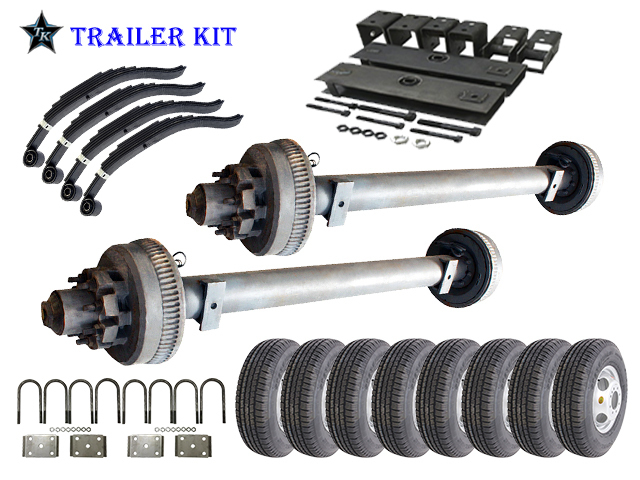 With one of our trailer kits, you can build the trailer you want for the purpose you want, and you’ll know that there are quality parts in every section. Once you have everything put together, you’ll have to license and register your new trailer. It is a vehicle, after all, and since you built it from a kit, you’re going to have to have the new Vehicle Identification Number (VIN) verified by a local law enforcement agency. Once you’ve done this, you’ll be able to go to your Department of Motor Vehicles and register your new trailer. Once you have a license plate for it, you can feel safe about taking it out on the road or to your next job site. Another advantage of buying a trailer kit from us is that, should you need replacement parts, we’ll be able to provide quality options. Every part in the kit should last for several years, but normal wear and tear can take more of a toll on certain parts, such as the TWAs, couplers, and pull chains. Should you need to replace these components, we can help you find the options that you know will fit perfectly with your trailer. If you’re looking for all the trailer parts you need in one place, then look no further than our kit options. You can build the trailer you want, and you won’t have to worry about whether or not your trailer is legal and roadworthy. If you purchased a trailer kit in the past and it didn’t have everything you needed to assemble your new trailer, then you might be hesitant to buy another one. Perhaps the kit didn’t have the safety chains you needed, or maybe it didn’t have all the necessary wiring components. You had to go searching for the right parts, and if you weren’t sure which ones you needed, you may have made multiple trips to the hardware or auto supply store. At The Trailer Parts Outlet, we’ve created kits that include every part you need, from the pull coupler in the front to the tail lights in the back, and everything in between! 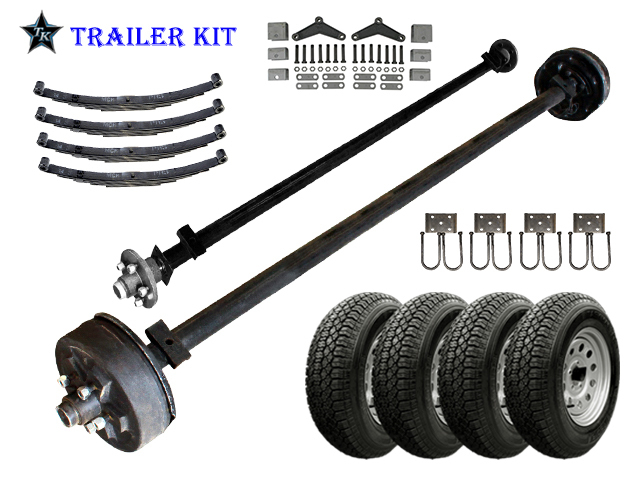 The axle is perhaps the most important part of the trailer. Without it, there would be no stability, and there would be no way for the trailer to roll down the road behind your truck. We have a great variety of axles sizes to choose from, and depending on the kit you select, you’ll get the appropriate axle for your specific needs. The axle comes fully assembled, so you won’t have to worry about putting everything together. 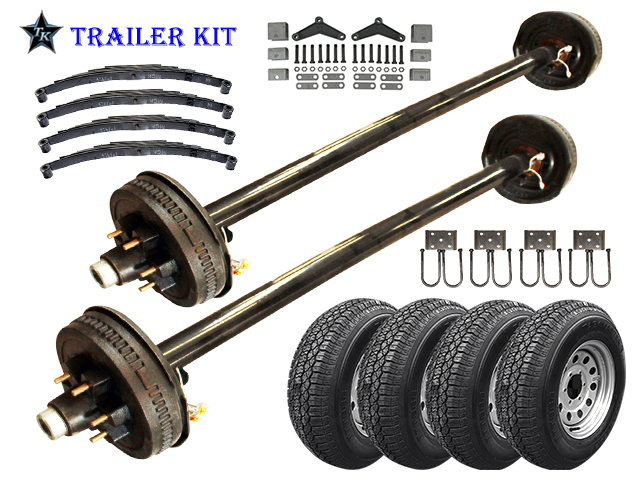 The springs and hanger kits are necessary for your trailer suspension, since you’re going to be putting weight on the trailer bed. You want to feel confident that your trailer will be able to support the load it’s carrying, and that your tires and wheels will be able to keep rolling, even with the bed is filled to its capacity. Each kit comes with the appropriately sized springs, which makes it easy to position and attach them. You’ll also have the U-bolt kits you need to attach your springs so that they’re in the right place. Tire and wheel assemblies, or TWAs, are also an integral part of your trailer, since without them, your trailer would simply be a box on the ground. We’ve precisely matched every TWA to each trailer kit, so you’ll have the right options to build your new equipment. By having the tires and wheels already assembled, you can simply mount them to the axle and have everything ready to go. In order for your trailer to be legally roadworthy, it needs to have the proper wiring and electrical parts. Our utility trailer kits come with two tail lights, one for each side, and both lights feature turn signal indicators. You may also have amber-colored clearance lights that help guide you when you’re backing up, and that help motorists see the edge of your trailer at night. You’ll also find the wiring harness length you need and the plug that will attach to your vehicle’s electrical connection. It’s imperative that your trailer has working lights, because if it doesn’t, you could end up with a ticket, a fine, or worse. Depending on the kit you choose, you may receive a pull coupler, safety chains, fenders, and a trailer jack. All of these parts are important components of your trailer, and when installed properly, they make your trailer safer and easier to use. You’ll need the appropriate hitch and ball to match the coupler, and we’ll include the size specifications with your kit. The safety chains are necessary to help prevent an accident, should the coupler come free while in transit. The fenders are there to cover and protect the sides of your trailer, as well as your TWAs. As for the jack, it’s included to make it easier to park and store your trailer when it’s not in use. If you have any questions about our trailer kits or the parts that are included in them, feel free to contact us at any time. We’re here to help however we can, and our goal is to make sure you find the perfect options every time! Once you’ve chosen your new trailer kit, you’re probably very excited to get started on assembling it. We’re proud to offer free shipping on all orders to commercial addresses in the contiguous United States, and we’ll make sure that you have all the delivery information regarding your order. Above all, we want you to be confident that your kit will arrive in a timely manner, and in great condition! We are able to deliver to residential addresses, but unfortunately, we cannot offer free shipping on these deliveries. This is due to the ability of semi trailers to access residential neighborhoods, and the liabilities and restrictions that come with those situations. If you’d like a shipping estimate for a residential delivery, please give us a call at (936) 348-6507 and we’ll gladly discuss your options over the phone. If you receive your kit and then decide that it’s not what you want, or you realize that it’s not going to be the right size or capacity for your intended purpose, you can return it within 14 days of purchase. If the kit is deemed to be in good condition upon a return inspection, we will issue a refund or an exchange within three to five business days. Regardless of the situation, we want you feel comfortable that you made the right decision in buying your kit from us. At The Trailer Parts Outlet, we want to be a company that you can trust for all your trailer needs. When it comes to kits, we’ve worked hard to create the perfect options for a number of industries and applications, and we know that you’ll be able to find the products that meet your needs. If you ever have any questions about a kit, or you want to know which one will be best for your specific job or industry, please contact us right away. If you live in or near Madisonville, Texas, feel free to stop by our location at 2209 Interstate 45 North. We’re open Monday through Friday from 8:00am to 5:00pm, and on Saturday from 9:00am to 12:00pm. We’re always happy to meet new people and help them find the right trailer kit. We look forward to providing you with the perfect trailer parts!